Lauren Bakst was the New Museum’s R&D (Research & Development) Season Fellow for the Fall 2014 Season devoted to the topic of CHOREOGRAPHY. In a series of three texts published on Six Degrees, Bakst shares several lines of inquiry she pursued while researching the R&D Season’s thematic during her residency, addressing how considerations of subjectivity, affect, memory, and history can be taken up through the skilled dancer’s body and choreographic forms within exhibitionary spaces. From September 2014 through March 2015, I worked within the New Museum’s Department of Education and Public Engagement as the R&D (Research & Development) Season Fellow. My position was temporary—it ran concurrent to the Fall R&D Season, which organized six months of programming around the CHOREOGRAPHY thematic, mining the topic for “its potential to negotiate the systems of value that govern intimacy, transmission, and exchange alongside an interrogation of the systems of control specific to different mediums and the politics of space.”1 As the Season Fellow, I occupied a point of connection among the various activities that occurred under the Department of Education and Public Engagement’s seasonal R&D umbrella. The CHOREOGRAPHY Season was anchored by two main projects: one with the artists in residence Gerard & Kelly (Brennan Gerard and Ryan Kelly), a collaborative duo that works within an interdisciplinary framework to create project-based installations and performances in art and dance venues, and the other with AUNTS, a community-building apparatus for organizing simultaneous art and performance activity in shared spaces. These projects unfolded through various phases of research and production in the Museum’s galleries and theater, taking the shape of exhibitions, live performances, conferences, screenings, online publications, workshops, an after-school program for teens, family day activities, and archival research. Gerard & Kelly’s six-month long residency2 took its longest public-facing form via “P.O.L.E. (People, Objects, Language, Exchange),” a research-based installation in the Museum’s Fifth Floor gallery that ran from October 8, 2014 through January 25, 2015. While there were artworks on display in the gallery, these works functioned primarily as frames for the space in which various actions occurred throughout the exhibition’s duration. For example, Interval (2013–14) is a sculpture comprised of a plywood floor that reoriented the coordinates of the existing gallery floor’s layout at a twenty-two-and-a-half-degree tilt; Re-Verb (2014) and Reverbs: interactions to relate to one another (2014) feature video documentation of, and scores for, the performance Verb Dance, which was previously presented at the Kitchen; and Untitled (To Borrow) (2014) consists of two twin mattresses spray-painted black, which were mounted side-by-side on the gallery’s rear wall. One of the activities that took place around these objects included “Open Pole,” a series of gatherings organized by Gerard & Kelly around two vertical dancing poles installed in the gallery. These events occurred during evenings when the Museum stayed open late at a discounted rate. “Open Pole” sessions hosted various outside collaborators who ran movement-based classes, practice sessions, and performances.3 Other events that took place in the gallery and were on view to Museum audiences were “In Bed With…,” four intimate conversations between Gerard & Kelly and invited guests that took place on mattresses dispersed throughout the gallery,4 and Reverberations (2014–15), a performance score I enacted repeatedly in which I recalled and transmitted my memories of the project’s events to Museum visitors. These encounters all explored structures of intimacy in a semi-public setting and the ways that people organized their bodies around various objects in the galleries throughout the course of the exhibition. This research and recursive documentation served to inform the subsequent exhibition in the Lobby Gallery, which took place for two weeks in February and explored fleeting encounters and processes of history and memory via sculpture, video, and live performance. In the language of institutions that present performance, dance is often defined as “live art.” While there are choreographers who have thoughtfully questioned this notion,7 the history of concert dance is rife with the theatrical enactment of the liveness of the body through displays of movement. Dance certainly has the remarkable capacity to bring attention to the humanly state of being alive for both the performer (through the sweat, breath, or exhaustion produced) and the witness (through responsive chills, tears, subtle shifts of weight, etc., produced). I would argue that “liveness” is not, however, an ontological prerequisite for dance. When presentations of dance in museums and visual art spaces lack precise framing devices, the discourse surrounding the work tends to rely on a reductive binary of animacy vs. inanimacy (i.e., the dancers “activated” the space).8 While others have addressed this recently in dance and art criticism by noting the ways in which dance provides economic benefits for museums through increased and return visits,9 I want to focus instead on the ways in which the “liveness” of performance is understood as unique to other forms of art through its presumed opposition to art objects that are considered inanimate. This inevitably disregards the potential liveness of objects and the body’s shifty shuffling between objecthood and subjecthood. As objects become increasingly more animate through technological developments and museums begin collecting not only paintings and sculptures but also performances,10 I’d like to consider how exhibitions and performances can frame the relations between bodies and objects in ways that do not rely on a false presumption of the clear opposition between the two. In addition to the exhibitionary components of the R&D Season that I’ve detailed, sixteen multidisciplinary thinkers took part in a peer-led reading and discussion group that focused on Season thematics, called the “New Museum Seminars: (Temporary) Collection of Ideas.” Artists in residence and the Season Fellow were encouraged to participate, as this forum for study and dialogue is a key part of the development process within the R&D structure. In a session led by Johanna Burton, Keith Haring Director and Curator of Education and Public Engagement, we read an essay by art critic and theorist Rosalind Krauss from 1977 entitled “Notes on the Index: Seventies Art in America, Part 2,” in which she sets up a triangulation between photography, sculpture, and dance in order to demonstrate the operations of the index within abstraction. Burton presented Krauss’s text around the same time that I saw Michal Samama’s performance Background Materials (2014) in October at the Chocolate Factory Theater in New York. Krauss’s thinking on various indexical forms—movement itself being one of them—helped me to consider Samama’s performance. Putting into practice the pedagogical model of Seminars in which we often read performances, artworks, and other cultural objects through the lens of theoretical texts (or vice versa), I found it instructive to consider Krauss’s text and Samama’s performance together in order to deal directly with some of the concerns brought to the surface by the research and production that I did for the R&D Season: the framing of bodies and objects, the indexical logic of performance, and the exhibitionary structure. Samama is an artist who creates body-based works. For Background Materials, Samama aimed to bring the dynamics of an exhibition space to a more theatrical and performative context. Upon entering the Chocolate Factory Theater for her performance Background Materials, Samama stood in the long hallway leading into the black box theater that functions as a lobby. I encountered her greeting two other audience members, casually inviting them to enter the theater where they could enjoy wine and snacks. Suddenly, Samama grabbed the underside of her lips so as to forcefully pry open her mouth, demanding that they look inside. In this gesture she was already asking audience members to bring their attention to the outside and inside, to the peripheries and the center. The Chocolate Factory Theater is an artist-founded and -led nonprofit theater in Long Island City, Queens. Its five-thousand-square-foot, formerly industrial building includes a theater that, to give you a sense of scale, can seat forty to fifty people on risers, as well as an unfinished basement space. Like Samama, many of the artists who have presented work at the Chocolate Factory Theater choose to make use of both the upstairs and downstairs spaces. The theater is an intimate white room with brick walls, two windows, pipes and radiators, and no fixed seating arrangement. In fact, for Background Materials, there were no chairs in the space. In the center of the room, there was a table with wine, cheese, and crudités. It was so banal—this reception setup—that it had the effect of feeling like a representation of the thing rather than the thing itself. If this was indeed an imitation of something like the opening of an exhibition, in this case, the white walls were unadorned. Whistle still in mouth, Samama put her clothes back on and gestured with her arm, beckoning the viewers to the basement below. Once there, she methodically opened a clear plastic trash bag. She held the bag open in front of her and spun it in a circle, letting it fill up. After several revolutions, she caught the air by tying the bag, then put the bag on the floor and proceeded to pour her weight over the bulbous mutable plastic form. Because of the pressure created by her weight, when Samama gently caressed the bag’s surface with her fingers, a harsh sound was produced—the bag’s equivalent of a scream. I wonder about that sound—was it produced by the bag or by the body, was it the plastic’s lament or Samama’s? Throughout the entirety of the performance, Samama maintained a calm and collected affect, a matter-of-fact disposition. I understand the bag as a kind of transposition of the body, wherein the exterior (the air in the room) became the interior (the shape of the thing). The sound emanating from a soft caress of the bag gave way to a lament that Samama could only express via the object. Like Hay’s monologue, or the succession of the artworks by Matta-Clark, Stuart, and Pozzi, this sound functioned as Samama’s supplemental discourse, captioning her movement. When the bag popped after a minute or so of Samama shifting her weight across its form, she would repeat the cycle with the same bag, until, after several rounds, she mounted the poked-and-prodded bag on the wall. It joined a row of other bags already hanging there, all of which pointed to the same process of (de)formation. These partially air-filled trash bags on the walls served to index these actions and revealed a history of prior occurrences. The wall, the plastic bag, and, later on, a mat covering the floor that Samama disappeared under—these objects and Samama’s relationship to them all served to unsettle any kind of clear distinction between subject and object, performance and exhibition. Samama made use of the strategies outlined by Krauss in “Notes on the Index”—the successive unfolding of the building, a reliance on its structure, and an indexical logic. 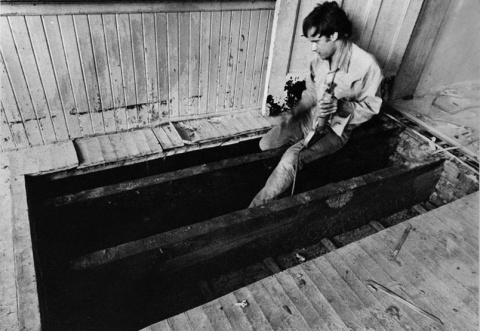 The main difference between Matta-Clark’s installation and Samama’s performance is the presence of the body. Whereas those who viewed “Rooms” did not see Matta-Clark actually cutting through the floor, the audience at the Chocolate Factory Theater experienced Samama filling, pressing, popping, and hanging the bag—the act and the index. Perhaps this is one way of articulating a relationship between dance and visual art spaces—instead of just seeing the trash bags hung on the wall, we also witness the labor that brought them there. Krauss writes, “In the piece by Matta-Clark the cut is able to signify the building—to point to it—only through a process of removal or cutting away. The procedure of excavation succeeds therefore in bringing the building into the consciousness of the viewer in the form of a ghost.”20 In the case of Samama, the lament of the bag and the sound emanating from the whistle are the ghost-like forms through which we come to recognize her subjecthood. Samama sets us up to see her as an object, but she only later becomes a subject by way of her relationship to objects. These speaking objects complicate the very category of “liveness,” which at times appears to have an ontological hold on performance, especially when its presentation in visual art spaces is framed through a binary of (in)animacy. Le Roy devised a system for the main gallery that three of the four performers present operated within. These three dancers were each assigned a location in the room where they would perform a given task: while I was there, the dancer against the left wall recycled loops of movement from Le Roy’s choreography; the performer against the right wall held still positions pulled from Le Roy’s work; and the performer against the wall closest to the gallery entrance delivered bits of their personal retrospective. The performance of Retrospective ran like clockwork. Each time a new visitor or group of visitors entered the room, one of the performers would let out a mechanical sound alerting the others to this arrival, at which point all three would run out of the room. Shortly after they’d crawl back in on hand and knees, quickly approaching the new visitor to announce a year, then return to their stations. 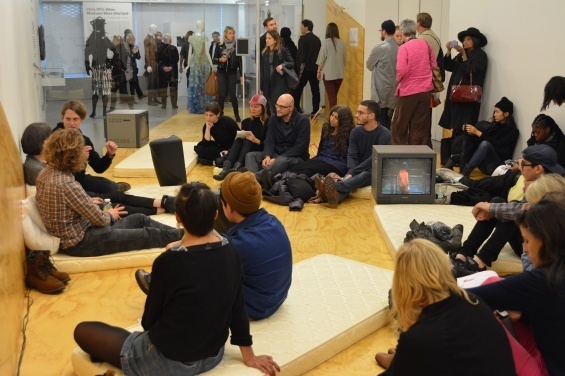 In opposition to this calibrated movement, the fourth performer in the gallery delivered their full-length “retrospective” to a select and willing audience, uninterrupted by the coming and going of visitors. In this closed circuit, the personal “retrospectives” of the ensemble of sixteen performers was constructed to be dependent on Le Roy’s archive. Furthermore, the only thing that connected the performers to each other (within this system) was Le Roy’s work. Granted, this was Le Roy’s retrospective, however, the choreography seemed to suggest that Le Roy’s archive not only encompassed his work, but also the retrospectives of the performers hired for the exhibition. The more Le Roy’s past solo choreography was repeated, multiplied across the bodies in the space, the more iconic and sedimented it became. The performers became something like stand-ins for Le Roy, exquisitely enacting his choreography and creating new meanings for his work by supplementing it with their life stories. Meanwhile, Le Roy was omnipresent without ever actually having to appear. When two of the performers, Ben Evans and Will Rawls, came to speak to our Seminars group about their experience as performers in Retrospective, Rawls addressed how the power of storytelling’s capacity for resignification was at play in this project—the way that acts of storytelling could transport a gesture to other contexts and histories. He mentioned that, within each performer’s retrospective, they had room to experiment, ask questions of the score, and even to challenge or subvert Le Roy’s work (if the performer wished to do so). While this space of intervention is critical, from what I witnessed, it seemed that the system Le Roy devised also functioned to isolate the performer’s stories and truncated the possible ways it could be received. In other words, while the life stories of each performer possessed a direct link to Le Roy’s work, the choreography of Retrospective kept them from accumulating to create any kind of collective impact on the work’s master chronology. The exhibition’s title, “Retrospective,” was a play on the conventional term used in the visual arts. Unlike most museum exhibitions, “Retrospective” had no curatorial wall text. (Only the title and the names of the participating artists were printed on the wall as an introduction, along with funding credits.) This seemed to suggest that when a museum presents a retrospective of dance—as opposed to visual art—a discursive, historical, and contextual frame is unnecessary. 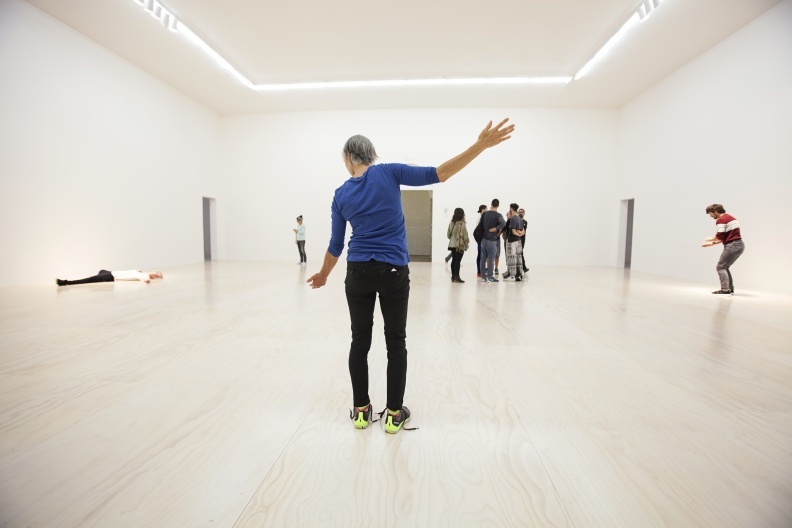 Such a lack of framing maintains dance’s status as exceptional within the space of museums. This was only reinforced by the dark and quiet final gallery, which was placed in stark opposition to the bright and buzzing primary gallery space. The three barely visible dummies, slumped over and propped up against the walls in seated positions, were the antithesis of the articulate, thoughtful, sweaty, and skilled human performers who filled the other rooms. However, these dolls echoed the sense of isolation that was created by Le Roy’s overarching organization of the performers in relation to one another. Unlike Samama’s Background Materials, which played with the conventions of exhibition and performance structures in order to make tangible the mutual exchanges between subjects and objects, Le Roy’s “Retrospective” relied on the presence of active bodies and inert objects. In my reception of the work, this had the effect of making the performers the objects of the exhibition, rather than highlighting their own subjectivity or narratives of self. Lauren Bakst is a trained dancer and an artist whose work takes the forms of choreography, writing, performance, and video. Her current project “Living Room Index and Pool,” an exhibition of installation and performance works with artist Yuri Masnyj, is on view at Pioneer Works in Brooklyn until April 26, 2015. Bakst teaches as part of the “Thinking, Making, Doing” curriculum at the School of Dance at the University of the Arts, Philadelphia. She is a contributing editor at BOMB magazine and regularly performs in the works of other artists, most recently that of Michelle Boulé and Gerard & Kelly. 1 “Fall 2014 R&D Season: CHOREOGRAPHY,” New Museum, accessed March 23, 2015, http://www.newmuseum.org/pages/view/choreography. 2 Gerard & Kelly’s six-month long residency was curated by Johanna Burton, Keith Haring Director and Curator of Education and Public Engagement. 3 “Open Pole” participants included Keisha Franklin (from Shockra Studio, a dance studio that provides hip-hop, pole, and ballet classes) and members of the New York City–based subway performance crews the Chosen Ones and We Live This. 4 The four participants in “In Bed With…” included writer and critic Chris Kraus, artist Andrea Fraser, legal scholar and advocate Heather McGhee, and choreographer Tere O’Connor. 5 “AUNTSforcamera” presented new work by Cara Francis, IMMA/MESS, Vanessa Justice, Anya Liftig, Karl Scholz, Larissa Velez-Jackson, Gillian Walsh, Collective Settlement (Felicia Ballos, Jean Brennan, and T. Charnan Lewis), and collaborators Salome Asega, Chrybaby Cozie, and Ali Rosa-Salas. 6 The lead artists invited to participate in the BYOC! (Bring Your Own Camera!) event at the New Museum were: Accidental Movement (with costumes by Christian Joy), Lauren Bakst, Oren Barnoy, Allison Brainard, Kim Brandt, Christen Clifford, Chrybaby Cozie, Collective Settlement (Felicia Ballos, Jean Brennan, and T. Charnan Lewis), DJ Feeling$ (Geo Wyeth), Ayano Elson, Stacy Grossfield, Vanessa Justice, Anya Liftig, and Stanley Love Performance Group. Many of these artists brought (or constitute) ensembles. Some of the AUNTS performers performing at TrouwAmsterdam were: Cara Francis & Christopher Loar, Danilo LVM & Gertjan Franciscus, IMMA/MESS, Karl Scholz, Keren Rosenberg & ENKA live, Mayke van Kruchten in the work of Edan Gorlicki, Mezhgan Saleh & Cammy Mai Tran, and Michele Rizzo. 7 I’m thinking here of dance and video artist Jillian Peña’s The Mothership (2009), a video work for a proscenium space which posited that the dance existed within the invisible exchange between the work and the viewer, i.e., the act of “being moved.” See Peña’s website at http://jillianpena.com/home.html. 8 For example, Katy Rogers’s catalogue essay “The Poetry of Space” focuses on the public programming for the 2013 exhibition, “Come Together: Surviving Sandy, Year 1,” that took place at Industry City in Sunset Park, Brooklyn. In the essay, she describes “Performing the Precarious: Day Into Night,” an afternoon of dance performances that took place throughout the galleries, during which I performed in Michelle Boulé’s White, alongside Boulé and Lindsay Clark. Of Boulé’s piece, Rogers writes, “In White, three dancers dressed in diaphanous white dresses raced and weaved and spun through a very long and spacious gallery filled with sculptures by Rachel Beach, Donald Moffett, Ursula von Rydingsvard, Arthur Simms, and others. The space quite literally came alive: the inanimate works themselves seemed to dance from their bases and walls in response to the energy of the live dancers.” Rogers quotes Boulé as being “inspired by the life of the work in the galleries.” Despite Boulé’s reference to the animacy of the objects and the field of energy already existing in the room, Rogers frames the work through the opposition of animate and inanimate forms. Rather than speaking to the particularities of Boulé’s work, this framing relies on a perceived formal distinction between the sculptures and the dancing. This distinction limits the perception of the work and sensationalizes the liveness of bodies, therefore shaping particular expectations around how bodies should “bring life” to museum and gallery spaces. Katy Rogers, “The Poetry of Space,” in Come Together: Surviving Sandy, 2014, accessed March 23, 2015, http://cometogethersandy.com/poetry-of-space/. 9 In his response to the 2012 Whitney Biennial, critic David Velasco writes, “As dance artist Mårten Spångberg observed in a recent talk at MoMA P.S.1, events and performance series mean return visits, and attendance is a museum scorecard for success.” His formulation at first seems cynical, but it also stakes a claim for the brute value of performance in institutional settings: “It’s not we who need the museums,” he argues, “it’s the museums that need us.” David Rimanelli, Amy Taubin, and David Velasco, “A Room of Their Own, Three Views on the Whitney Biennial,” Artforum 50.9 (May 2012): 271–79. 10 In a recent New York Times article, Hilarie M. Sheets cites the Guggenheim’s acquisition of performance works by Tino Sehgal and Gerard & Kelly and the Walker Art Center’s acquisition model for Ralph Lemon’s Scaffold Room, which involves a collection of memories from participating artists and spectators. See Hilarie M. Sheets, “When the Art Isn’t on the Walls, Dance Finds a Home in Museums,” New York Times, January 25, 2015, accessed March 23, 2015, http://www.nytimes.com/2015/01/25/arts/design/dance-finds-a-home-in-museums.html. 11 Rosalind Krauss, “Notes on the Index: Seventies Art in America. Part 2,” October 4 (Autumn 1977), 58. 13 This particular question is a part of the score for “No Time to Fly” which can be accessed through the multimedia resource “Using the Sky” on Motion Bank. http://scores.motionbank.org/dh/#/set/sets (accessed April 21, 2015). 21 For more about Xavier Le Roy’s performance Self Unfinished, see Ben Coccio, Performance 15: On Line/Xavier Le Roy, 1999, video, 4:04 min., accessed March 18, 2015, http://www.moma.org/explore/multimedia/videos/136/946.